As an insurance agent I get to see that magical progression into adulthood when the offspring of my clients receive their driver’s license. With this rite of passage comes an awesome responsibility on the part of the youngster. It is also important for the new motorist as well as the seasoned driver to understand and respect the dangers and risks involved in using an automobile. This might seem elementary, dear Watson, but most of us take driving for granted and lose focus on loss preventative techniques that will help keep us out of harms way. 1. Alcohol is the number one contributor to accidents. Don’t use a mind altering drug when you drive and assume that most motorists on the road after midnight have been drinking. 2. Do not use a cell phone while driving, it is illegal in Connecticut. If you have to talk to someone, stop the car and do it. 3. Your mirrors are a great visual aid but don’t trust them entirely. Most have blind spots. 4. Antilock brakes usually don’t work well in wet or icy conditions. 5. When the light turns green at an intersection, don’t gun the accelerator. The other driver may be running his red light. 6. Pass trucks quickly. Truckers may not see an auto that is just behind their mirrors. 7. You may know the order of rotation at a 4 way stop but you can bet that most have forgotten. Show how courteous you are and let the others go first. 8. Drowsiness from lack of sleep is becoming epidemic – especially in teens. A car can go 100 feet with the blink of an eye. If you find yourself falling asleep behind the wheel, get off the road immediately. Take a nap or get some exercise and make an honest assessment of whether you should continue driving. 9. It’s okay to go the speed limit. Our crowded roadways and frantic lifestyle has exacerbated the risks of driving. Relax, give yourself plenty of time, and happy motoring. 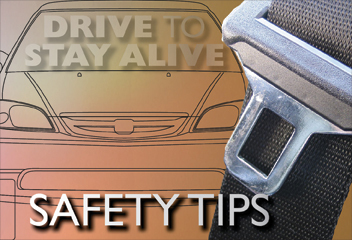 To learn more about how we can keep you safe on the roads, contact Guy Hatfield at 203 .256.5660 today.